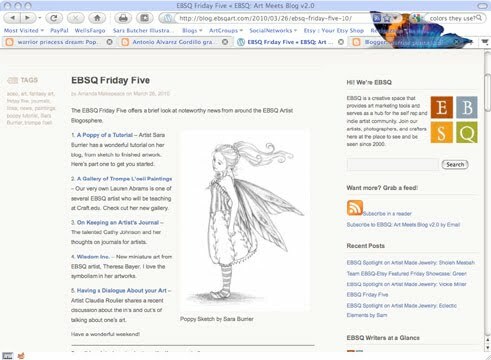 To start off, I would like to say a big THANK YOU to Amanda Makepeace from EBSQ for featuring my blog on the blog post "EBSQ Friday Five". It's such an encouragement to keep moving forward. To see the post and discover the other four Amanda picked visit the EBSQ Friday Five blog post! Also I want to answer some questions posted in the comments. 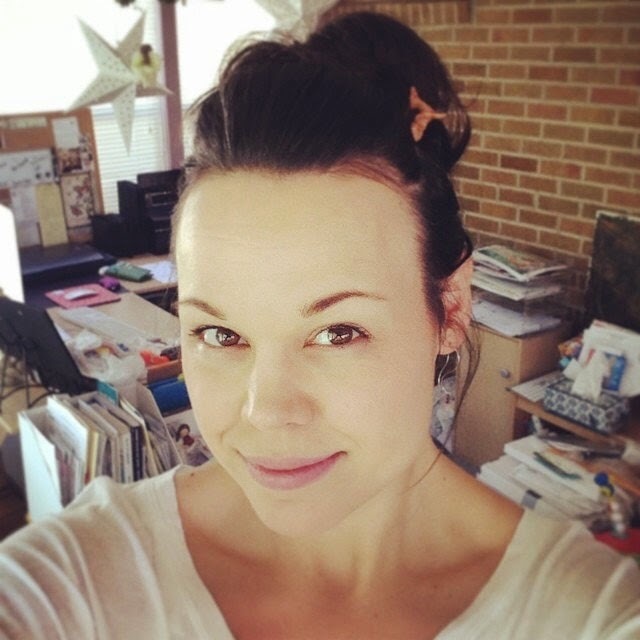 The first one was about color choices for publishing, as a children's book illustrator. The answer? Honestly, I haven't found one. There is no mention about color restrictions for a children's book in my research so far. My assumption is that technology today allows us to use whatever colors we wish. If I'm wrong, I would like someone to let us all know the restrictions, for that would be valuable information. My process in going about my color choices has recently changed a bit. I am becoming more and more aware of how they work together, thanks to having to remember and reteach myself for my advanced students. 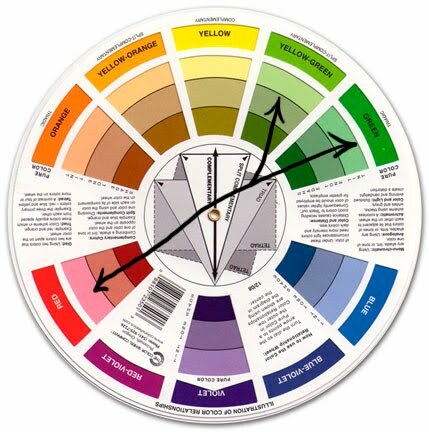 I finally purchased a color wheel. 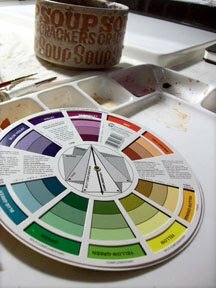 I know, I've been painting for about 10 years and haven't owned a color wheel. It's amazing how much information a little and simple wheel can give! My color has always been instinctive, and I've never had many issues with that, but to be able to explain why I choose my colors is a new matter. To myself, my students, and now you. 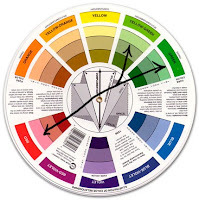 So if you don't have a color wheel I advice you get one. Mine was only about $3 at Hobby Lobby. It's small enough to go wherever I go, and it has basic color theory right on the wheel. A great visual resource to have around. Plus, I don't know about you, but I enjoy moving it around and interacting with it. So based on that, I sat and actually decided before painting what my color scheme was going to be. I decided to go with a split complementary palette. I enjoy complementary because both colors enhance one another, which helps with getting the soft glowing effect I strive for. I also took into consideration the time of year I'm creating this piece and the subject matter. One, I'm painting a fairy so naturally I want colors I can have fun with but can also be brought down to a earth tone. Second, my fairy is holding poppies, which are a red orange color. The complimentary of red is green. Third, it's the end of March which means spring! The first flowers that are popping up near my home are a blue purple in color. And according to my color wheel, I have almost a perfect match after listing my objectives. 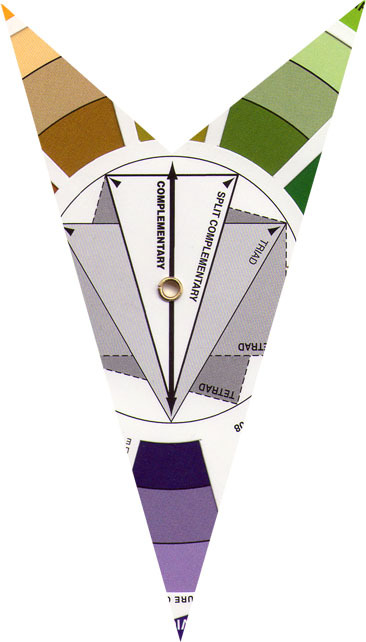 On my color wheel the split complementary closest to what I want is Yellow-Orange, Yellow-Green, and Violet. What's nice about this, although red isn't one of those colors it becomes my accent color to enhance my greens. I was excited about this selection because with Yellow-Orange I can also use browns! And with my violet I can bring in some blues subtly. A perfect match that allows many possibilities! Plus I now have a visual helper when trying to make the colors I envision in my head, and to compare whether I've achieved that color or not. When I paint I don't lay out the colors, meaning I don't prep them before I begin. I mix the colors I want as I go. For me it's all about being in the moment as I paint. If I do too much thinking before hand it tends to take away the "spirit" of my process in relationship to what I'm painting. I want to make sure I stay connected to, or within the imagination of the subject. So when I'm painting I play music that relates to the world I'm creating on paper. 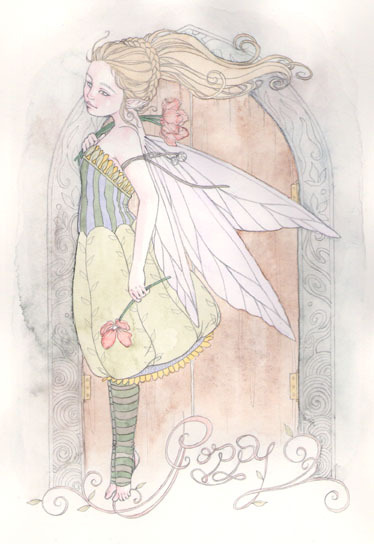 I try to pretend I'm the fairy (sounds silly I know), or play out in my head a day in her life as her, envisioning what her personality is, her character, etc. I am supposing this is why others are able to connect with my work as well. We don't relate to what I paint because of the subject matter (I've never truly met with a fairy face to face, or walked through their world through their eyes), but maybe because of how I paint. The life that is breathed into the subject through water and paint, and for me most of all through the breath God breathes through me. I truly believe God works through us to speak to others, especially through art. Tip: Take it slow! You definitely want control as you paint inside your lines. There is absolutely no rush, tho you may be tempted to. Get in close with your 3/0 brush and with your distance from the paper to your face. Be emerged with your painting and get lost in the action of painting. Always remember, you may want to dab your brush on the paper towel before you go to the paper from the palette. Too much water/paint in your brush can make it difficult to stay in control of your watercolor. When I begin my base colors I make sure I mute them down with water so I can build them up as I go. If I make the colors too dark that leaves me restricted to what I am able to do in the future. Even if I can barely see the color, at least I've gotten rid of the white paper. The white of the paper can be distracting and sometimes makes it difficult to envision the final painting. Tip: Don't get bogged down or unmotivated with the base colors. There have been times in this part of the process I loose interest in what I am painting because I'm not seeing the bold colors I want. Just keep reminding or telling yourself this is going to be a beautiful work of art and get excited for the end product. Like running a race, your legs might hurt in the process of running, but getting to the finish line is satisfying. Here is what I ended up mixing for my colors. I will use these throughout the painting, and as I build my painting up I will use less water and more paint to create bolder color. I also want to say, if you're unsure or anxious about your color choices, you can always do a quick color study! I have in the past, and usually do for basics when doing a book project (colors for characters, environment, etc.). 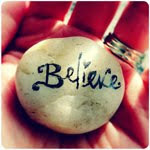 It can be fairly quick to do! Just scan in your image, take it into Photoshop, cut your image onto a new layer, make the layer "Multiplied", add new layer underneath, and begin to add basic color. If you don't have a scanner make several photocopies and use watercolors or colored pencils to layout your color plan. Tip: Go to any store that has a paint section and grab paint swatches. There are usually color combos already made to take out a lot of guess work. These are great to have around for color inspiration or planning. Next, time to add the shadows! "Next, time to add the shadows!" The link at the end of this section doesn't seem to be active to the next stage of the tutorial.